Video from at least two homes captured two men on Friday kicking in doors and stealing large items from inside – all in broad daylight. INDIANAPOLIS -- People living in several areas across Indianapolis say their sense of security has been shattered after their homes were broken into over the past week, and surveillance video shows several of those burglaries may have been committed by the same two men. It’s unclear who broke into Matthew Hoover’s home near 59th and Meridian streets, but the way the thieves broke in is similar to multiple other burglaries over the past week. After the windstorm knocked his power, Hoover said he returned home early last week to find his door had been kicked in and money missing from inside. Hoover’s neighbors across the street were also targeted around the same time. 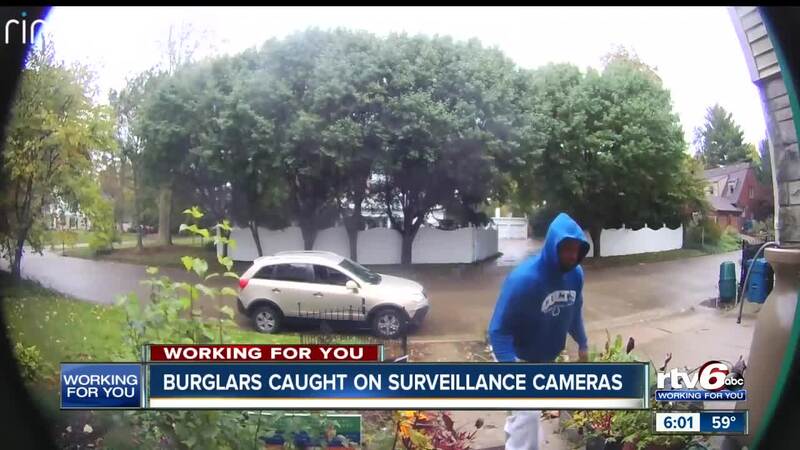 Just a few blocks away, two men were caught on camera breaking into Danielle Havens’ home near 46th Street and Graceland Avenue on Friday. “A man wearing an Old Navy shirt called back to the guy in the car and said ‘nobody is home.’ A guy came out, a big man, and shouldered his way through the door,” said Danielle Havens. 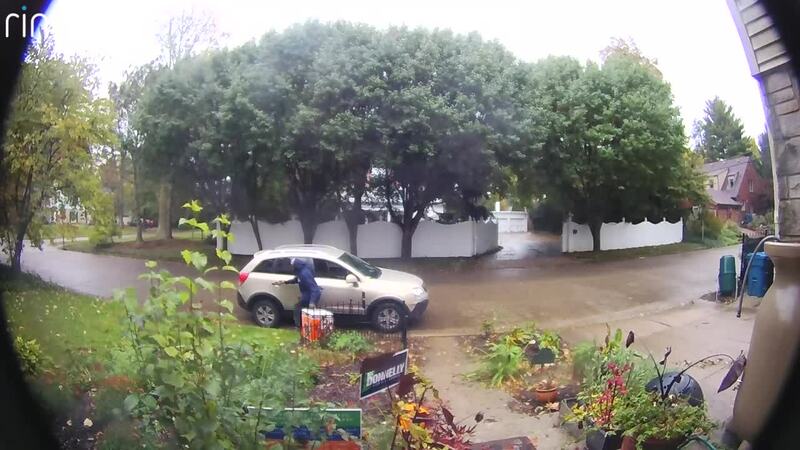 Havens said the thieves took a TV, a laptop and a brand-new leaf blower – you can see them making away with the stolen items in the video below. The same two men were also caught on surveillance video at a home near 56th Street and Allisonville Road where they stole silverware and a couple of checkbooks. Surveillance video pictured below shows the same man in the Old Navy shirt and another man getting out of the same white SUV and walking up to the victim’s door. Police have not yet identified these suspects. If you have any information on who the men in these images are, contact the Indianapolis Metropolitan Police Department or Crime Stoppers of Central Indiana at 317-262-8477. If you have an alarm system, make sure it’s on. Put your lights on a timer. Report any suspicious persons or vehicles to police.